The Inuit languages are a closely related group of indigenous American languages traditionally spoken across the North American Arctic and to some extent in the subarctic in Labrador. 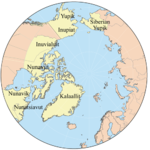 The related Yupik languages are spoken in western and southern Alaska and in the far east of Russia, but are severely endangered in Russia today and spoken only in a few villages on the Chukchi Peninsula. The Inuit live primarily in three countries: Greenland, Canada (specifically in the Nunatsiavut region of Labrador, the Nunavik region of Quebec, Nunavut, and the Northwest Territories), and the United States (specifically the coast of Alaska). The total population of Inuit speaking their traditional languages is difficult to assess with precision, since most counts rely on self-reported census data that may not accurately reflect usage or competence. Greenland census estimates place the number of speakers of varieties of Inuit there at roughly 50,000, while Canadian estimates are at roughly 35,000. These two countries count the bulk of speakers of Inuit language variants, although about 7,500 Alaskans speak varieties of Inuit out of a population of over 13,000 Inuit. The Inuit languages have a few hundred speakers in Russia. In addition, an estimated 7,000 Greenlandic Inuit live in European Denmark, the largest group outside Greenland, Canada and Alaska. Thus, the global population of speakers of varieties of Inuit is on the order of nearly 100,000 people. The traditional language of the Inuit is a system of closely interrelated dialects that are not readily comprehensible from one end of the Inuit world to the other, and some people do not think of it as a single language but rather as a group of languages. However, there are no clear criteria for breaking the Inuit language into specific member languages since it forms a dialect continuum. Each band of Inuit understands its neighbours, and most likely its neighbours' neighbours; but at some remove, comprehensibility drops to a very low level. As a result, Inuit in different places use different words for its own variants and for the entire group of languages, and this ambiguity has been carried into other languages, creating a great deal of confusion over what labels should be applied to it. In Greenland the official form of Inuit language, and the official language of the state, is called Kalaallisut. In other languages, it is often called Greenlandic or some cognate term. The Eskimo languages of Alaska are called Inupiatun, but the variants of the Seward Peninsula are distinguished from the other Alaskan variants by calling them Qawiaraq, or for some dialects, Bering Strait Inupiatun. In Canada, the word Inuktitut is routinely used to refer to all Canadian variants of the Inuit traditional language, and it is under that name that it is recognised as one of the official languages of Nunavut and the Northwest Territories. However, one of the variants of western Nunavut is called Inuinnaqtun to distinguish itself from the dialects of eastern Canada, while the variants of the Northwest Territories are sometimes called Inuvialuktun and have in the past sometimes been called Inuktun. In those dialects, the name is sometimes rendered as Inuktitun to reflect dialectal differences in pronunciation. The Inuit language of Quebec is called Inuttitut by its speakers, and often by other people, but this is a minor variation in pronunciation. In Labrador, the language is called Inuttut or, often in official documents, by the more descriptive name Labradorimiutut. Furthermore, Canadians – both Inuit and non-Inuit – sometimes use the word Inuktitut to refer to all Inuit language variants, including those of Alaska and Greenland. The phrase "Inuit language" is largely limited to professional discourse, since in each area, there is one or more conventional terms that cover all the local variants; or it is used as a descriptive term in publications where readers can't necessarily be expected to know the locally used words. Although many people refer to the Inuit language as Eskimo language, this is a broad term that also includes the Yupik languages, and is in addition strongly discouraged in Canada and diminishing in usage elsewhere. See the article on Eskimo for more information on this word. The language of the Inuit is an Eskimo–Aleut language. It is fairly closely related to the Yupik languages and more remotely to the Aleut language. These cousin languages are all spoken in Western Alaska and Eastern Chukotka, Russia. It is not discernibly related to other indigenous languages of the Americas or northeast Asia, although some have proposed that it is related to the Uralic languages such as Finnish and the Sami languages in the proposed "Uralo-Siberian" grouping, or even Indo-European languages as part of the hypothetical "Nostratic" superphylum. Some consider it a Paleosiberian language, although that is more a geographic than a linguistic grouping. Early forms of the Inuit language were spoken by the Thule people, who overran the Dorset culture that had previously occupied Arctic America at the beginning of the 2nd millennium. By 1300, the Inuit and their language had reached western Greenland, and finally east Greenland roughly at the same time the Viking colonies in southern Greenland disappeared. It is generally believed that it was during this centuries-long eastward migration that the Inuit language became distinct from the Yupik languages spoken in Western Alaska and Chukotka. Until 1902, a possible enclave of the Dorset, the Sadlermiut (in modern Inuktitut spelling Sallirmiut), existed on Southampton Island. Almost nothing is known about their language, but the few eyewitness accounts tell of them speaking a "strange dialect". This suggests that they also spoke an Eskimo–Aleut language, but one quite distinct from the forms spoken in Canada today. 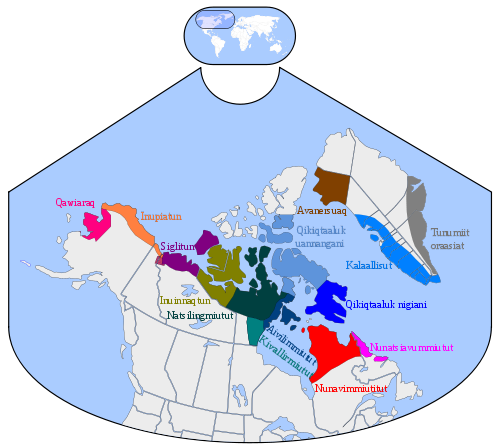 The western Alaskan variants retain a large number of features present in proto-Inuit language and in Yup'ik, enough so that they might be classed as Yup'ik languages if they were viewed in isolation from the larger Inuit world. Distribution of Inuit language variants across the Arctic. The Inuit languages are a fairly closely linked set of languages which can be broken up using a number of different criteria. Traditionally, Inuit describe dialect differences by means of place names to describe local idiosyncrasies in language: The dialect of Igloolik versus the dialect of Iqaluit, for example. However, political and sociological divisions are increasingly the principal criteria for describing different variants of the Inuit languages because of their links to different writing systems, literary traditions, schools, media sources and borrowed vocabulary. This makes any partition of the Inuit language somewhat problematic. This article will use labels that try to synthesise linguistic, sociolinguistic and political considerations in splitting up the Inuit dialect spectrum. This scheme is not the only one used or necessarily one used by Inuit themselves, but its labels do try to reflect the usages most seen in popular and technical literature. In addition to the territories listed below, some 7,000 Greenlandic speakers are reported to live in mainland Denmark, and according to the 2001 census roughly 200 self-reported Inuktitut native speakers regularly live in parts of Canada which are outside traditional Inuit lands. Qawiaraq is spoken on the southern side of the Seward Peninsula and the Norton Sound area. In the past it was spoken in Chukotka, particularly Big Diomede island, but appears to have vanished in Russian areas through assimilation into Yupik, Chukchi and Russian-speaking communities. It is radically different in phonology from other Inuit language variants. Inupiatun (North Slope Iñupiaq) is spoken on the Alaska North Slope and in the Kotzebue Sound area. The variants of the Kotzebue Sound area and the northwest of Alaska, called Malimiutun or Malimiut Inupiatun. The Inuit languages are an official language in the Northwest Territories, and the official and dominant language of Nunavut; it enjoys a high level of official support in Nunavik, a semi-autonomous portion of Quebec; and is still spoken in some parts of Labrador. Generally, Canadians refer to all dialects spoken in Canada as Inuktitut, but the terms Inuvialuktun, Inuinnaqtun, and Inuttut (also called Nunatsiavummiutut or Labradorimiutut) have some currency in referring to the variants of specific areas. Greenland counts approximately 50,000 speakers of the Inuit languages, of whom over 90% speak west Greenlandic dialects at home. Kalaallisut, or in English Greenlandic, is the name given to the standard dialect and official language of Greenland. This standard national language has been taught to all Greenlanders since schools were established, regardless of their native dialect. It reflects almost exclusively the language of western Greenland and has borrowed a great deal of vocabulary from Danish, while Canadian and Alaskan Inuit languages have tended to take vocabulary from English or sometimes French and Russian. It is written using the Latin script. The dialect of the Upernavik area in northwest Greenland is somewhat different in phonology from the standard dialect. Tunumiit oraasiat, the Tunumiit dialect, (or Tunumiisut in Greenlandic, often East Greenlandic in other languages), is the dialect of eastern Greenland. It differs sharply from other Inuit language variants and has roughly 3000 speakers according to Ethnologue. Inuktun (Or Avanersuarmiutut in Greenlandic) is the dialect of the area around Qaanaaq in northern Greenland. It is sometimes called the Thule dialect or North Greenlandic. This area is the northernmost settlement area of the Inuit and has a relatively small number of speakers. It is reputed to be fairly close to the North Baffin dialect, since a group of migratory Inuit from Baffin Island settled in the area during the 19th and early 20th centuries. It counts under 1000 speakers according to Ethnologue. Greenlandic was strongly supported by the Danish Christian mission (conducted by the Danish state church) in Greenland. Several major dictionaries were created, beginning with Poul Egedes's Dictionarium Grönlandico-danico-latinum (1750) and culminating with Samuel Kleinschmidt's (1871) "Den grønlandske ordbog" (Transl. "The Greenlandic Dictionary") that contained a Greenlandic grammatical system that has formed the basis of modern Greenlandic grammar. Together with the fact that until 1925 Danish was not taught in the public schools, these policies had the consequence that Greenlandic has always and continues to enjoy a very strong position in Greenland, both as a spoken as well as written language. Eastern Canadian Inuit language variants have fifteen consonants and three vowels (which can be long or short). Consonants are arranged with five places of articulation: bilabial, alveolar, palatal, velar and uvular; and three manners of articulation: voiceless stops, voiced continuants, and nasals, as well as two additional sounds—voiceless fricatives. The Alaskan dialects have an additional manner of articulation, the retroflex, which was present in proto-Inuit language. Retroflexes have disappeared in all the Canadian and Greenlandic dialects. In Natsilingmiutut, the voiced palatal stop /ɟ/ derives from a former retroflex. Almost all Inuit language variants have only three basic vowels and make a phonological distinction between short and long forms of all vowels. The only exceptions are at the extreme edges of the Inuit world: parts of Greenland, and in western Alaska. For a more detailed description specific to Nunavut Inuktitut, see Inuit grammar. The Inuit language, like other Eskimo–Aleut languages, has a very rich morphological system, in which a succession of different morphemes are added to root words (like verb endings in European languages) to indicate things that, in languages like English, would require several words to express. (See also: Agglutinative language and Polysynthetic language) All Inuit language words begin with a root morpheme to which other morphemes are suffixed. The language has hundreds of distinct suffixes, in some dialects as many as 700. Fortunately for learners, the language has a highly regular morphology. Although the rules are sometimes very complicated, they do not have exceptions in the sense that English and other Indo-European languages do. I cannot hear very well. This sort of word construction is pervasive in the Inuit languages and makes it very unlike English. In one large Canadian corpus – the Nunavut Hansard – 92% of all words appear only once, in contrast to a small percentage in most English corpora of similar size. This makes the application of Zipf's law quite difficult in the Inuit language. Furthermore, the notion of a part of speech can be somewhat complicated in the Inuit languages. Fully inflected verbs can be interpreted as nouns. The word ilisaijuq can be interpreted as a fully inflected verb: "he studies", but can also be interpreted as a noun: "student". That said, the meaning is probably obvious to a fluent speaker, when put in context. The morphology and syntax of the Inuit languages vary to some degree between dialects, and the article Inuit grammar describes primarily central Nunavut dialects, but the basic principles will generally apply to all of them and to some degree to Yupik languages as well. Both the names of places and people tend to be highly prosaic when translated. Iqaluit, for example, is simply the plural of the noun iqaluk "fish" ("Arctic char", "salmon" or "trout" depending on dialect). Igloolik (Iglulik) means place with houses, a word that could be interpreted as simply town; Inuvik is place of people; Baffin Island, Qikiqtaaluk in Inuktitut, translates approximately to "big island". Common native names in Canada include "Ujarak" (rock), "Nuvuk" (headland), "Nasak" (hat, or hood), "Tupiq" or "Tupeq" in Kalaallisut (tent), and "Qajaq" (kayak). Inuit also use animal names, traditionally believing that by using those names, they took on some of the characteristics of that animal: "Nanuq" or "Nanoq" in Kalaallisut (polar-bear), "Uqalik" or "Ukaleq" in Kalaallisut (Arctic hare), and "Tiriaq" or "Teriaq" in Kalaallisut (ermine) are favourites. In other cases, Inuit are named after dead people or people in traditional tales, by naming them after anatomical traits those people are believed to have had. Examples include "Itigaituk" (has no feet), "Anana" or "Anaana" (mother), "Piujuq" (beautiful) and "Tulimak" (rib). Inuit may have any number of names, given by parents and other community members. In the 1920s, changes in lifestyle and serious epidemics like tuberculosis made the government of Canada interested in tracking the Inuit of Canada's Arctic. Traditionally Inuit names reflect what is important in Inuit culture: environment, landscape, seascape, family, animals, birds, spirits. However these traditional names were difficult for non-Inuit to parse. Also, the agglutinative nature of Inuit language meant that names seemed long and were difficult for southern bureaucrats and missionaries to pronounce. Thus, in the 1940s, the Inuit were given disc numbers, recorded on a special leather ID tag, like a dog tag. They were required to keep the tag with them always. (Some tags are now so old and worn that the number is polished out.) The numbers were assigned with a letter prefix that indicated location (E = east), community, and then the order in which the census-taker saw the individual. In some ways this state renaming was abetted by the churches and missionaries, who viewed the traditional names and their calls to power as related to shamanism and paganism. They encouraged people to take Christian names. So a young woman who was known to her relatives as "Lutaaq, Pilitaq, Palluq, or Inusiq" and had been baptised as "Annie" was under this system to become Annie E7-121. People adopted the number-names, their family members' numbers, etc., and learned all the region codes (like knowing a telephone area code). Until Inuit began studying in the south, many did not know that numbers were not normal parts of Christian and English naming systems. Then in 1969, the government started Project Surname, headed by Abe Okpik, to replace number-names with patrilineal "family surnames". But contemporary Inuit carvers and graphic artists still use their disk number as their signature on their works of art. A popular belief exists that the Inuit have an unusually large number of words for snow. This is not accurate, and results from a misunderstanding of the nature of polysynthetic languages. In fact, the Inuit have only a few base roots for snow: 'qanniq-' ('qanik-' in some dialects), which is used most often like the verb to snow, and 'aput', which means snow as a substance. Parts of speech work very differently in the Inuit language than in English, so these definitions are somewhat misleading. The "fact" that there are many Inuit words for snow has been put forward so often that it has become a journalistic cliché. The Inuit use a base-20 counting system. Because the Inuit languages are spread over such a large area, divided between different nations and political units and originally reached by Europeans of different origins at different times, there is no uniform way of writing the Inuit language. Though all except the syllabics use the Latin alphabet, all of them are a bit different from each other. The syllabics used to write Inuktitut (titirausiq nutaaq). The characters with the dots represent long vowels: in the Latin transcription, the vowel would be doubled. Most Inuktitut in Nunavut and Nunavik is written using a script called Inuktitut syllabics, based on Canadian Aboriginal syllabics. The western part of Nunavut and the Northwest Territories use Latin alphabet usually identified as Inuinnaqtun. In Alaska, two other Latin alphabets are used. Nunatsiavut uses an alphabet devised by German-speaking Moravian missionaries, which included the letter kra. Greenland's Latin alphabet was originally much like the one used in Nunatsiavut, but underwent a spelling reform in 1973 to bring the orthography in line with changes in pronunciation and better reflect the phonemic inventory of the language. Inuktitut syllabics, used in Canada, is based on Cree syllabics, which was devised by the missionary James Evans based on Devanagari a Brahmi script. The present form of Canadian Inuktitut syllabics was adopted by the Inuit Cultural Institute in Canada in the 1970s. The Inuit in Alaska, the Inuvialuit, Inuinnaqtun speakers, and Inuit in Greenland and Labrador use Latin alphabets. Though presented in syllabic form, syllabics is not a true syllabary, but an abugida, since syllables starting with the same consonant are written with graphically similar letters. All of the characters needed for Inuktitut syllabics are available in the Unicode character repertoire, in the blocks Unified Canadian Aboriginal Syllabics. ^ Hammarström, Harald; Forkel, Robert; Haspelmath, Martin, eds. (2017). "Inuit". Glottolog 3.0. Jena, Germany: Max Planck Institute for the Science of Human History. ^ "Indigenous Languages Spoken in the United States (by Language)". yourdictionary.com. Retrieved 2012-02-20. ^ "Inuktitut, Greenlandic: A language of Greenland". Ethnologue: Languages of the World. Retrieved 2012-02-20. ^ a b "Alaska Native Languages: Inupiaq". University of Alaska Fairbanks. Archived from the original on 2006-04-24. Retrieved 2012-02-20. ^ a b "Greenlandic". Ethnologue. ^ "iqaluk". Asuilaak Living Dictionary. Retrieved 2011-07-19. ^ Ann Meekitjuk Hanson. "What's in a name?". nunavut.com. Retrieved 2012-02-20. ^ "Project Surname: Listening to Our Past". Francophone Association of Nunavut. Retrieved 2012-02-20. ^ "Glossary". katilvik.com. August 20, 2004. Archived from the original on 2008-07-26. Retrieved 2012-02-20. ^ Geoffrey K. Pullum (1991). The Great Eskimo Vocabulary Hoax and Other Irreverent Essays on the Study of Language. University Of Chicago Press. p. 236. ISBN 0-226-68534-9. Retrieved 2012-02-20. Alia, Valerie (1994) Names, Numbers and Northern policy: Inuit, Project Surname and the Politics of Identity. Halifax NS: Fernwood Publishing. Collis, Dirmid R. F., ed. Arctic Languages: An Awakening ISBN 92-3-102661-5 "Available in PDF via the UNESCO website" (PDF). (2.68 MB). Dorais, Louis-Jacques (2010) The Language of the Inuit. Syntax, Semantics, and Society in the Arctic. Montreal: McGill-Queen's University Press. Greenhorn, Beth Project Naming: Always On Our Minds, Library and Archives Canada, Canada. Mallon, Mick Inuktitut Linguistics for Technocrats. Mallon, Mick (1991) Introductory Inuktitut and Introductory Inuktitut Reference Grammar. ISBN 0-7717-0230-2 and ISBN 0-7717-0235-3. Spalding, Alex (1998) Inuktitut: A Multi-dialectal Outline Dictionary (with an Aivilingmiutaq base). ISBN 1-896204-29-5. Spalding, Alex (1992) Inuktitut: a Grammar of North Baffin Dialects. ISBN 0-920063-43-8. Wikimedia Commons has media related to Inuit language. Alt.folkore.urban on Eskimo words for snow. This page was last edited on 26 March 2019, at 15:57 (UTC).